For today’s post, I am at the highest point in the metropolitan London area, standing opposite Jack Straw’s Castle. 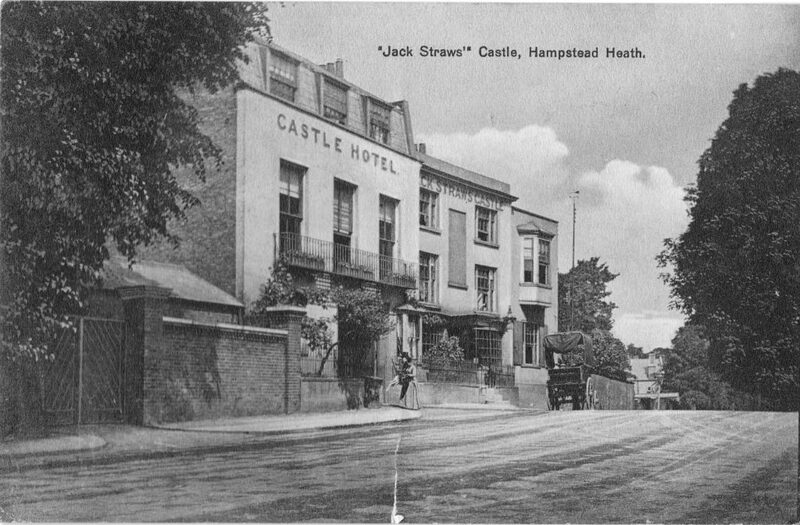 Jack Straw’s Castle was one of the most well known pubs around Hampstead Heath. 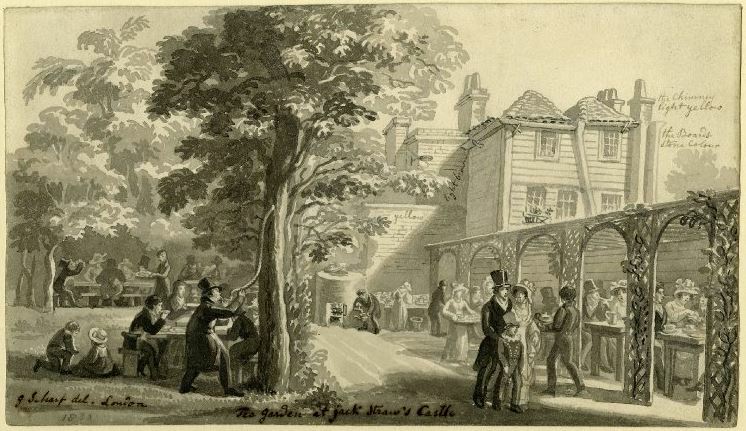 A coaching inn as well as a place for those walking across the heath to visit, along with weekend and Bank Holiday crowds. My father photographed the building just after the last war and the photo below is his view of Jack Straw’s Castle in 1949. You may well be wondering how I know that my father’s photo is of Jack Straw’s Castle, given the changes between 1949 and 2019, however if you look at the very top of the tallest building, the faded words Jack Straw’s Castle can just be seen. Also, the building on the far left of both photos, along with the brick wall with two pillars, are the same in both photos. 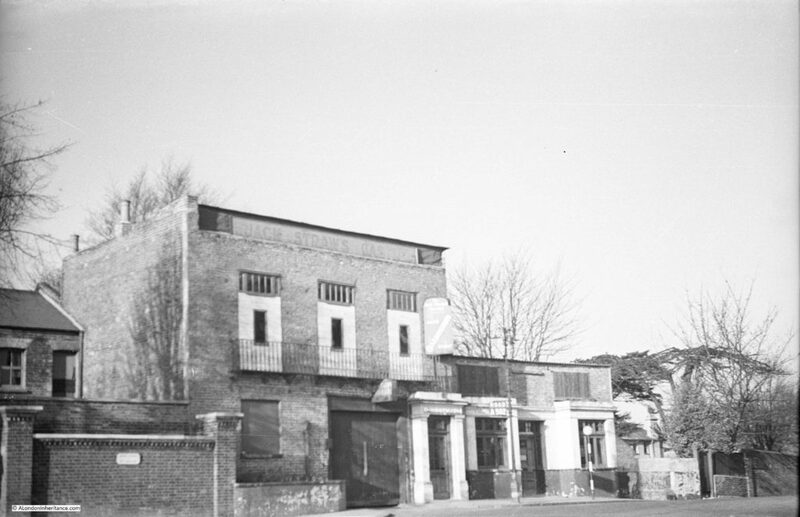 The building was demolished and rebuilt in 1964 to a rather striking design by Raymond Erith, however it is no longer a pub, having been converted into apartments and a gym. 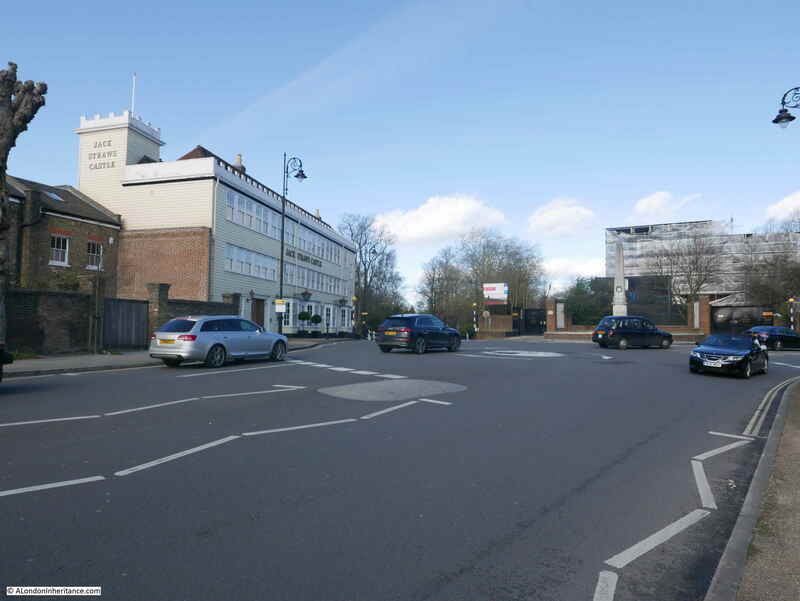 The building is Grade II listed which has helped to preserve key features of Erith’s design, despite developers trying to push the boundaries of how much they could change. Jack Straw, after who the pub was named, is a rather enigmatic figure. General consensus appears to be that he was one of the leaders of the Peasants Revolt in 1381, however dependent on which book or Internet source is used, he could either have led the rebels from Essex, or been part of the Kent rebellion. Jack Straw may have been another name for Wat Tyler and some sources even question his existence. 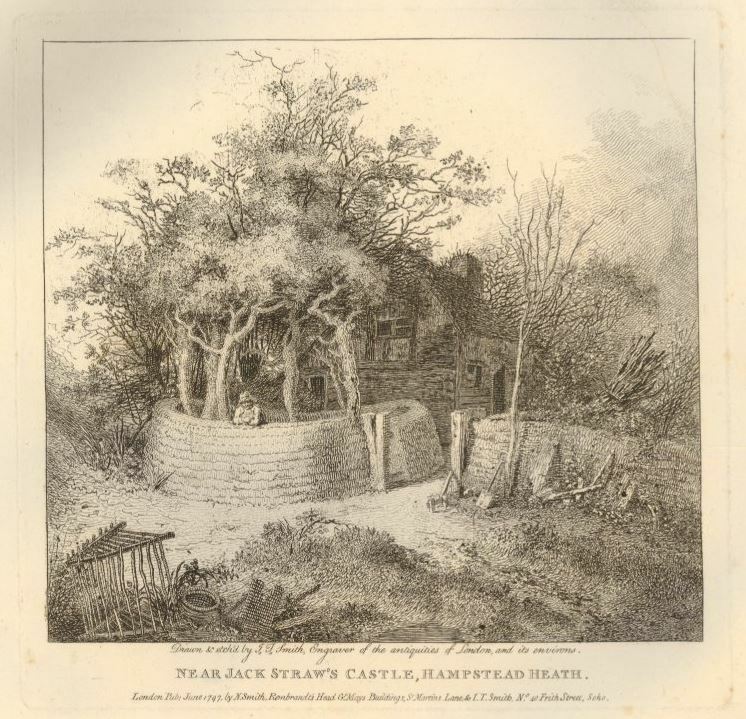 Any connection with Hampstead Heath and the site of Jack Straw’s Castle seem equally tenuous – he may have assembled his rebels here, made a speech to the rebels before they marched on London, or escaped here afterwards. Out of the hyve cam the swarm of bees. So hydous was the noyse — a, benedicitee! Given The Canterbury Tales were written not long after the Peasants Revolt, this reference by Geoffrey Chaucer does probably confirm his existence. The reference to “Flemyng kille” is to the targeting of the houses of Flemish immigrants in London by the rebels. I cannot though find any firm evidence of Jack Straw’s association with Hampstead or the site of the pub. 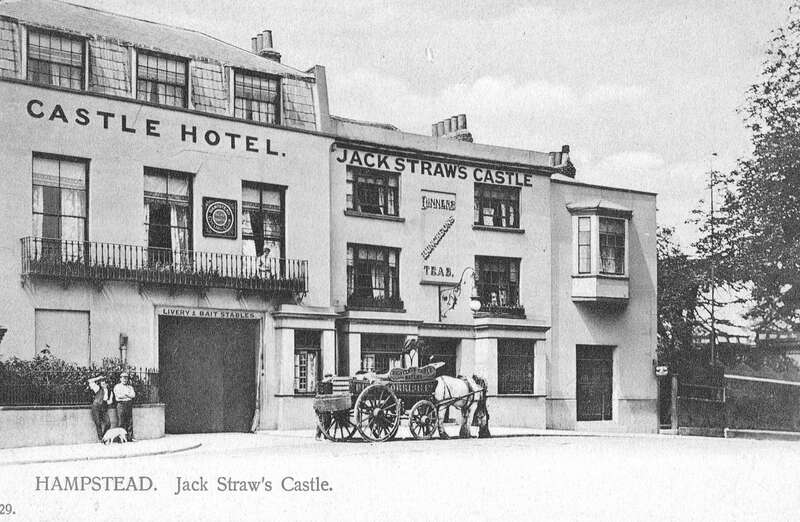 My father’s photo was of a rather sad looking building, however before the bombing of 1941, Jack Straw;s Castle was a rather lovely coaching inn. The following photo is from a postcard from around or just before the First World War showing Jack Straw’s Castle, and demonstrating that part of the series of buildings was the Castle Hotel. It all looks rather idyllic. A cart is parked outside, a well dressed couple are entering the Castle Hotel, and there are small trees and plants growing in frount of the buildings. The road to Golders Green disappears off past the buildings. 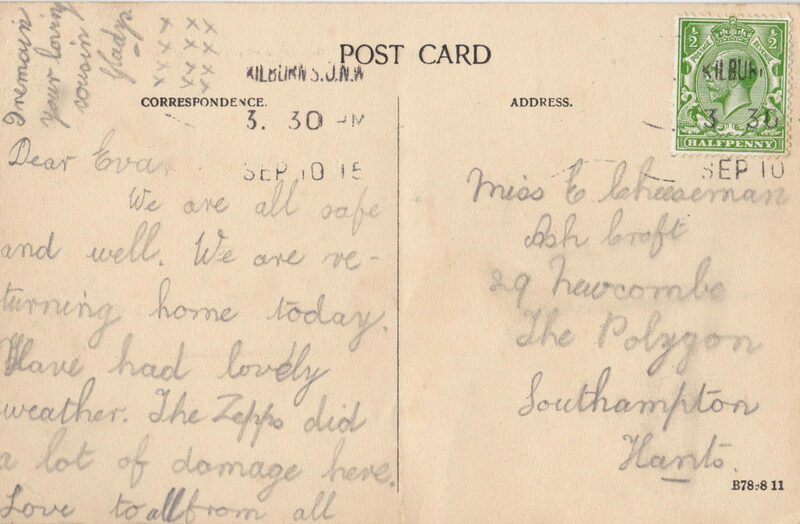 The rear of the postcard reveals that London was not so idyllic when it was posted. The card is dated 10th September 1915 and the author has written “The Zeppo did a lot of damage here”, probably referring to the raid on the 8th September 1915 when a Zeppelin attacked London, dropping the largest bomb to land on the city during the first war, with the raid killing 22 people in total. 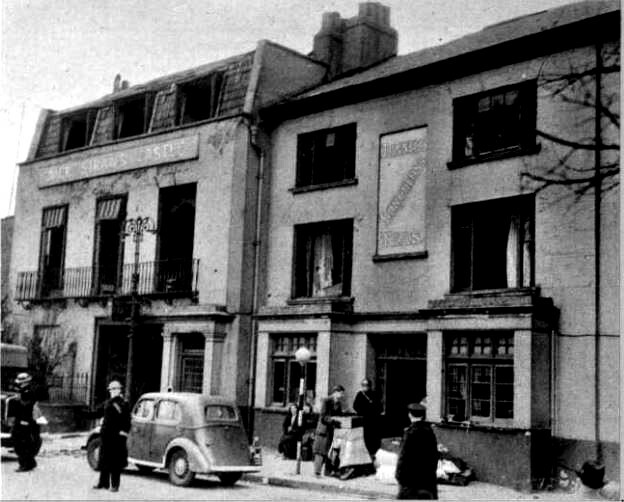 A later photo than the above postcard as the pub has now lost the bay windows on the ground floor and has the windows that would remain in my father’s photo. The two carts in the above photo possibly delivering Nevill’s Bread to Jack Straw’s Castle and Hotel, along with a delivery from the Civil Service Cooperative Society. In the following photo, the cart is delivering High Class Table Waters. The above photo shows how there are frequently traces of previous buildings in the buildings we see today. 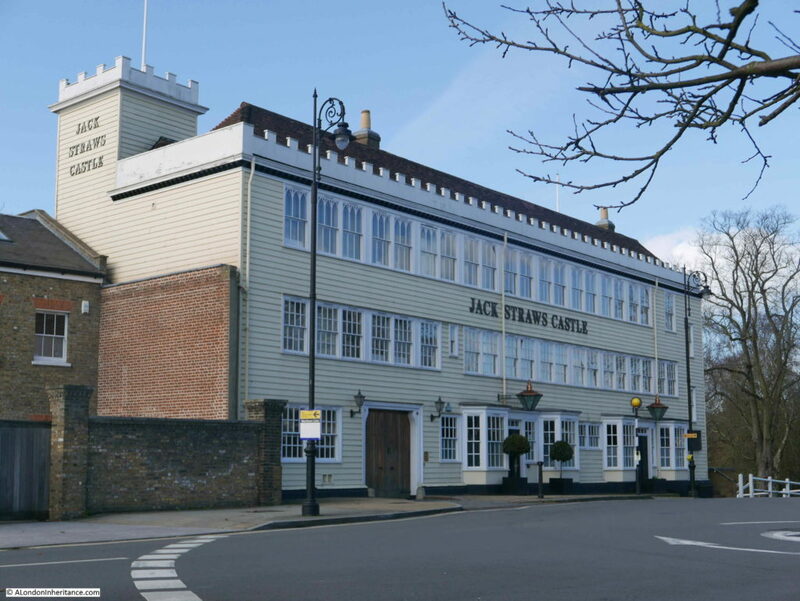 Jack Straw’s Castle was a Coaching Inn, and the large doors on the left have “Livery & Bait Stables”, but compare the position of these large doors with my 2019 photo above and you will also see a large set of doors in roughly the same position, although the 1964 version of Jack Straw’s Castle had no need to provide a stables. Passing into Jack Straw’s Castle, we find the usual number of visitors who have come up in Hansoms to enjoy the view, to dine off its modern fare, and to lounge about its gardens. The inn, or hotel, is not by any means an ancient one, and it would be difficult to find out any connection between the present hostelry and the rebellion which may, or may not, have given it a name. The following is all that we could glean from an old magazine which lay upon the table at which we sat and dined when we last visited it, and it is to be feared that the statement is not to be taken wholly ‘ for gospel’ – Jack Straw, who was second in command to Wat Tyler was probably entrusted with the insurgent division which immortalised itself by burning the Priory of St. John of Jerusalem, thence striking off to Highbury, where they destroyed the house of Sir Robert Hales, and afterwards encamping on Hampstead heights. Jack Straw, whose castle consisted of a mere hovel, or a hole in the hill-side, was to have been king of one of the English counties – probably of Middlesex; and his name alone of all the rioters associated itself with a local habitation, as his celebrated confession showed the rude but still not unorganised intentions of the insurgents to seize the king, and, having him amongst them, to raise the entire country. Gardens at the back of pubs and inns have probably been a popular attraction for as long as these establishments have existed, and today a pub with a garden is a perfect place to spend a summer’s evening or weekend afternoon. The garden at the back of Jack Straw’s Castle looks perfect in this drawing from 1830 by George Scharf (©Trustees of the British Museum). The drawing is interesting as it appears to contain notes for a later coloured version. Scribbled text alongside the building record that the chimney is light yellow, the boards are stone colour and the brick wall is yellow. Jack Straw’s Castle was obviously a local landmark in what was a very rural area. The following print from 1797 showing an old cottage surrounded by trees and bracken and is labelled “Near Jack Straw’s Castle, Hampstead Heath” as the inn was probably the only local reference point (©Trustees of the British Museum). My father’s photo was of the building just after the war showing a shadow of the former inn. The following photo from 1941 shows Jack Straw’s Castle in 1941 in the days following the bombing. The windows have been blown out, but difficult to see what other damage has been caused to the structure of the building. From this photo I would have expected that Jack Straw’s Castle could have been repaired, however shortage of materials and people during the war probably prevented any repair work, and over the years any structural damage and the building being left in this state resulted in the building being unsafe, and walls demolished to result in the building that my father photographed. Although Jack Straw’s Castle is very different, the buildings to the left look as if they are much the same as their original construction. There appear to be four individual houses in the above photo. The name adjacent to the entrance is “Old Court House”. 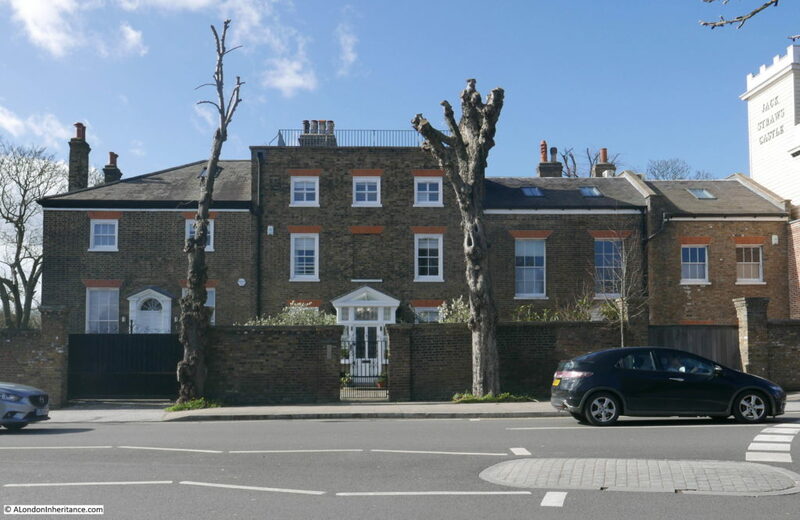 The Victoria County History volume for Hampstead refers to these buildings as having been built by Thomas Pool who purchased Jack Straw’s Castle in 1744 and built two houses in 1788. The Victoria County History states that in 1820 they were converted into a single house, with name changes over the years of Heath View, Earlsmead, and finally Old Court House. Underneath the name plate is an intercom system with four buttons so I assume they are four individual homes, but how and when they converted from the original two houses to the current buildings, I am unsure. Jack Straw’s Castle sits on a very busy road junction, where roads from Hampstead, Highgate and Golders Green converge. Whilst I was trying to take photos there was a continuous stream of traffic. 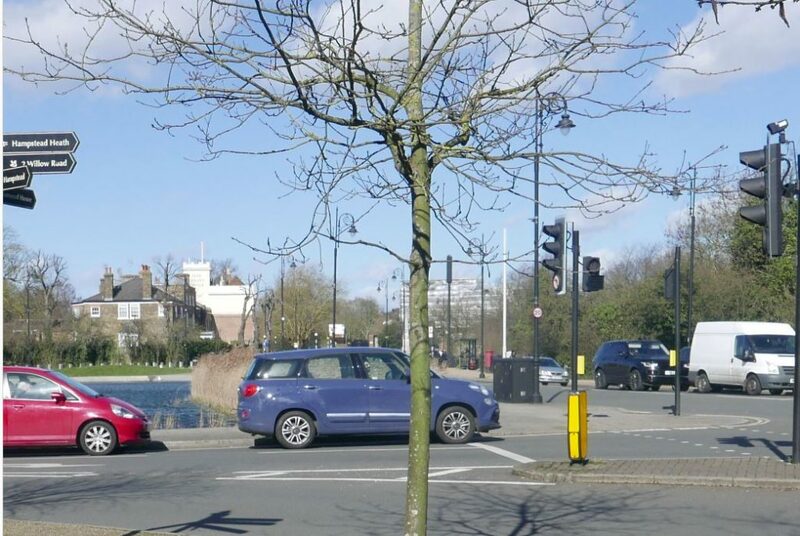 In the following photo, the road on the left leads to Golders Green, the road on the right leads to Highgate (passing a building which is still a pub – the Spaniards), and I am standing by the road that leads up from Hampstead. After visiting Jack Straw’s Castle, I walked down into Hampstead. This took me alongside Whitestone Pond. The pond was originally named Horse Pond as it was a drinking point for horses on the passing road, I will find the origin of the new name in a moment. 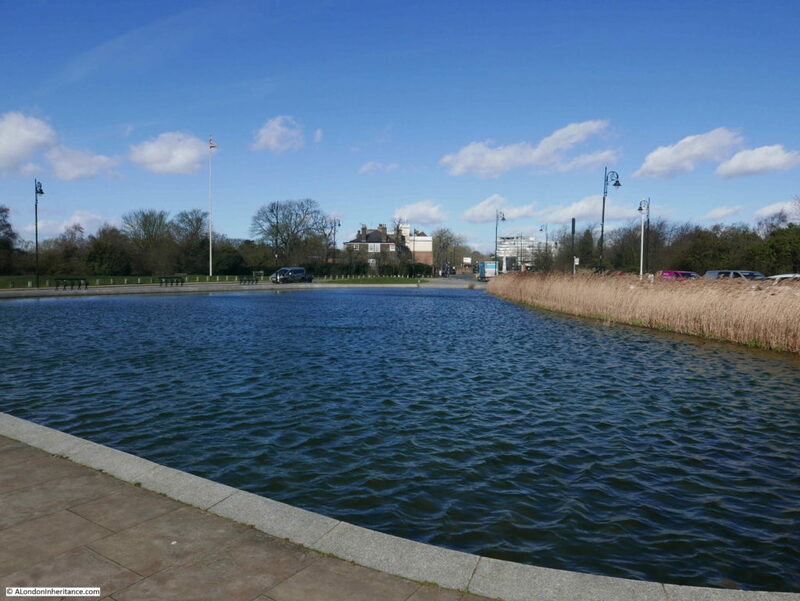 This area is the highest point in London, with according to the Ordnance Survey map, the pond being at 133m above sea level and Jack Straw’s Castle being at 135m. It was originally fed by rain water and dew, however I believe it now also has an artificial supply as the height of the pond means there was no natural underground or stream sources of water. This view dates from 1936 and shows Whitestone Pond, with the side of the Old Court House and Jack Straw’s Castle in the distance. I took the following photo of the same view, but I have no idea why I stupidly did not move to get the tree in a different position as it is obscuring the war memorial which can be seen in the distance in the 1936 view. Just to the left of where I was standing for the above photo, is the source of the name Whitestone Pond. This is a milestone and states “IV miles from St Giles, 4 1/2 miles 29 yards from Holborn Bars”. 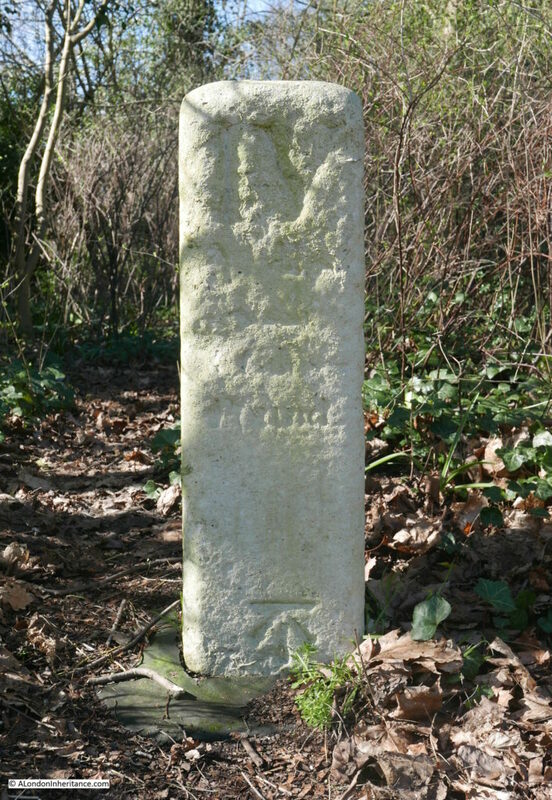 There is a similar milestone near the Flask pub in Highgate (see my post here) which gives a distance of 5 miles from St Giles Pound. These two milestones show that there were two main routes, either side of Hampstead Heath, leading down to St. Giles and then via Holborn, into the City. There is one final unexpected find before heading off down into the centre of Hampstead, close to the milestone is a covered reservoir with an unusual looking dome on top. 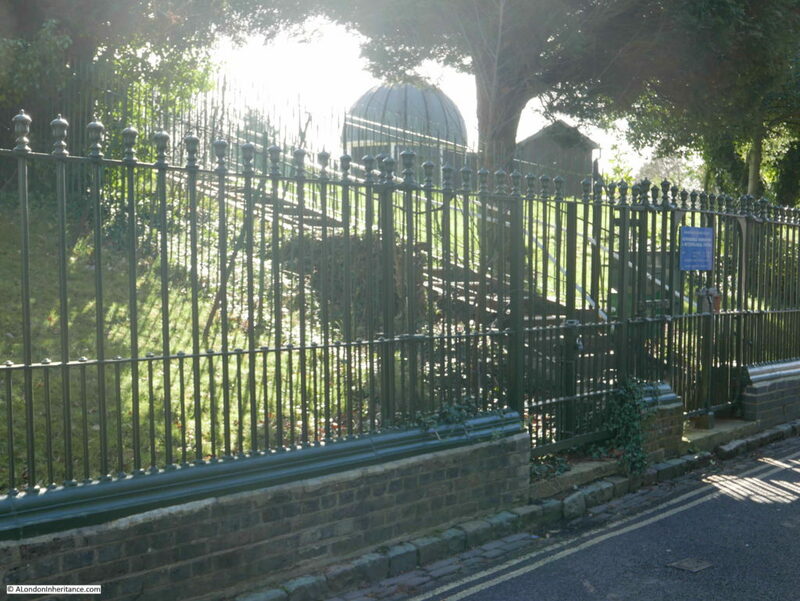 This is the astronomical observatory of the Hampstead Scientific Society – a rather unique place to observe the night sky, high above the rest of London. One of the very few locations across London that provides public viewing. Unfortunately, the observatory is currently closed whilst restoration work is carried out. It is a shame that Jack Straw’s Castle is no long a pub. It is an impressive building in an equally impressive location – although I must admit that i prefer the pre-war building. I have read so many different interpretations of the origin of the name Jack Straw and possible associations with Hampstead so i suspect we will never know the truth behind Jack Straw, but it is good that there is still a very visible reminder of the Peasants Revolt at the highest spot in Hampstead, 638 years after the event. This entry was posted in London Pubs and tagged Hampstead, Hampstead Heath on March 31, 2019 by admin. My dad, (born in 1901 in the area) took me many times to this part of Hampstead. We’d go mainly to sail my pond yacht, the pond being a favourite sailing pond for enthusiast as it was not deep and had a concrete bottom so was safe for me to wade out to retrieve a stranded model. Always known as the Leg of Mutton pond, the name Whitestone Pond being new to me. Dad told me that it’s original purpose was allow wagons and carts to drive in and soak the wooden wheels – which if dried out in hot weather the spokes would become loose. This accounts for the two in and out ramps. Thank you. I have wondered about those ramps on occasion when I’ve walked past the pond. Fascinating. I too visited Whitestone pond in the 50’s, watching men and lads sailing their model boats. I progressed, in the 60’s, to enjoying a tipple in Jack Straw’s Castle before returning across the heath to Parliament Hill Fields, Swains Lane, and home to Chester Road. Always was a wonderful walk and still is. 60 years later. 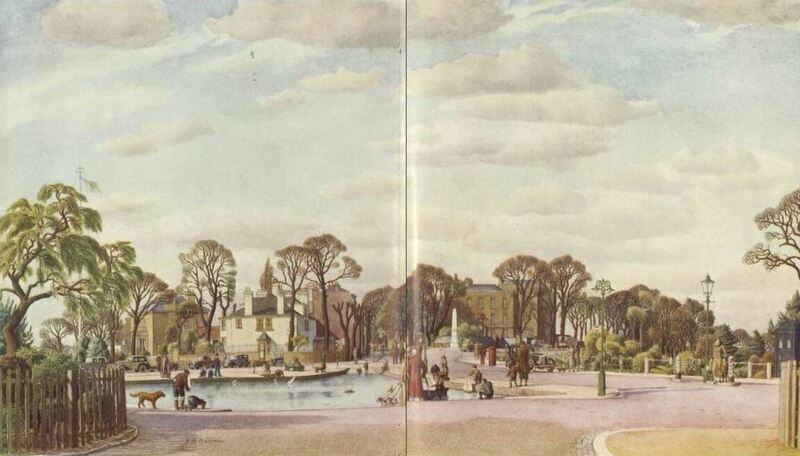 My father, Eric Clarke, as a greengrocer of Dartmouth Park Hill, had horses and carts to collect goods from Covent Garden market and then distribute them to his customers; he said that the pond was not only a watering hole, but also served to rehydrate the cart’s wheels, and cool the horses down in warm weather. 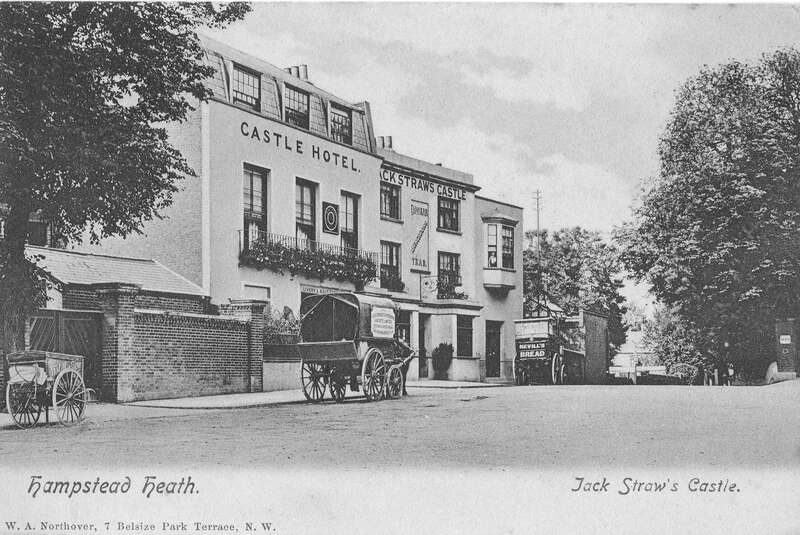 I have fond memories of walking over the Heath extension or up through the Heath itself from Goders Grenn to Whitestone Pond .with my father on Sunday mornings in the 1950’s and early 60’sI’m my memories I think of Jack Straws Castle as a functioning pub and don’t remember the bomb damage. Did the pub reopen for a while before being redeveloped or do I merely have a sentimental reconstruction. Of the past.. I remember too children sailing boats and paddling in the pond. I was told the pond was so farmers carts could have the country mud washed off their wheels before proceeding down the gentrified streets of London. One day,I really will go to Hampstead and the heath. Never been there, but there’s still time. Of course, Admin, if you keep coming up with such excellent posts, I feel as though I know it already. After writing my 40/50’s memories of Whitestone Pond (aka ‘the Leg of Mutton pond’) I remembered that somewhere I have a beer mat, picked up when visiting Jack Straw’s Castle in the 70’s. Would you believe it, there it was, next to my favourite chair. I’ve scanned it and now have placed it in a safe place. Thank you for this memory jogging post. I think you will find that the current incarnation of Jack Straw’s Castle is much later than 1964. The old buildings were a functioning pub (from vague recollection probably up to the late 1990s) and were then redeveloped as residential/office/gym. The current building is much bulkier than the original (or the later) pub. I also thought that. Knowing that area really well, over a long period of time, I thought it was a pub until much later. And, I am there all the time and that building is way later than 1964, and also its kind of use. Thanks for a marvelous post concerning a place I visit often when in town. I never took the time to look up the history or current use of Jack Straw’s Castle or Whitestone Pond. I’ve walked past this spot many times on jaunts around the area, particularly on the way to or from the upper Heath and one of my favorite spots in London: the Hill Garden & Pergola just up North End Way a hundred yards or so. I’ve also walked past the White Stone marker many times heading up Hampstead Grove past Fenton House to the Hill Garden and never noticed it there, tucked away to the left. The Vale of Health, just east of Jack Straw’s Castle, down in a secluded dell at the edge of the Heath, is also a splendid little residential nook through which to walk. Here’s a photo of Jack Straw’s Castle in 1962, shortly before it was rebuilt: https://www.gettyimages.co.uk/detail/464416971. Looking at the old pictures noticed the absence of street furniture and clutter not like now ,lovely part of London still -great article as usual. Thanks for these great photos of Jack Straw’s Castle and also to Malcolm, for the link to it as I remember it in the 1950’s and 60’s…my mother was appalled when it was changed into a mock-castle and never got used to it. It still gives me a shock! However the history of Jack Straw’s connection to it is very interesting. The Whitestone Pond was renovated (late 1950’s?) and ended up with a lot more concrete round it…I seem to remember the south side being open to wade into. I remember it had a Punch and Judy show there several times a year. Whitestone pond was renovated much more recently (last 10/15 years) with tall grass around the edges. I live a mile or two away and my daughter was born in the maternity hospital (since demolished) on the corner of East Heath Rd. Often visited Jack Straws back in sixties. One of a few pubs in North London where one could take a lady to impress! My friend’s brother was the last licensee of Jack Straw’s Castle. Late 1990’s. so we had the privilege of being able to roam all over the building. I remember one rather drunken evening, when the pub has closed for the night, exploring all the floors and rooms. We sat for some time in a square room at the rear of the building on the top floor (not shown in any photographs). Fabulous views of the lights across north London. I never visited again and it closed soon afterwards.